The Genius Milano Smooth Glide Retractable Screen is another solution for wider single doors or double French doors where a Smooth Fabric, Single Panel Screen System is preferred. NOTE: Opening Height must be at least 13" Greater than the Opening Width. Opening Width *: 12" 13" 14" 15" 16" 17" 18" 19" 20" 21" 22" 23" 24" 25" 26" 27" 28" 29" 30" 31" 32" 33" 34" 35" 36" 37" 38" 39" 40" 41" 42" 43" 44" 45" 46" 47" 48" 49" 50" 51" 52" 53" 54" 55" 56" 57" 58" 59" 60" 61" 62" 63" 64" 65" 66" 67" 68" 69" 70" 71" 72"
Is the Threshold Flat or Sloped? Genius Milano Smooth Glide Retractable Screens with Counter Weight System. 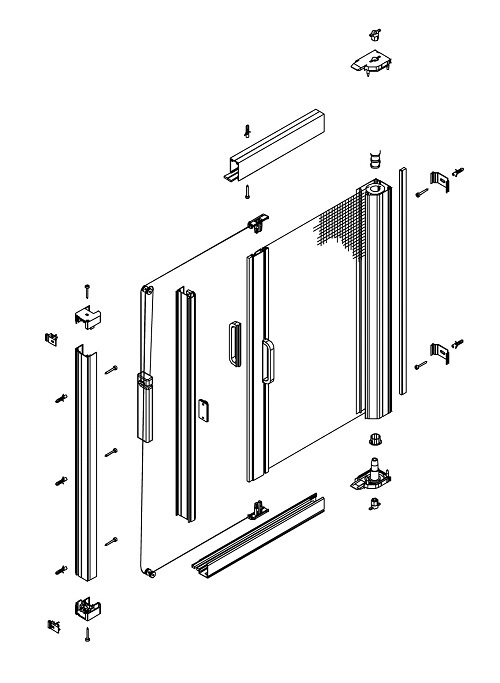 For Single, Double and French Door applications. The Genius Milano Smooth Glide Retractable Screen is another solution for wider single doors or double French doors where a Smooth Fabric, Single Panel Screen System is preferred. This screen system uses a counter weight to offset the tensioned screen. The Milano Smooth Glide provides a smooth sliding screen that can be positioned anywhere as you move it across the door opening. The Milano Smooth Glide is a completely sealed screen system, with brush-lined top and bottom guides and a brush seal behind the screen housing, to keep flying insects outside where they belong.